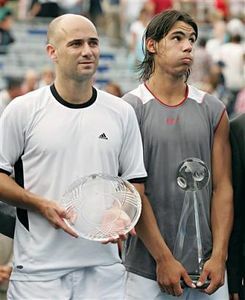 8/14/05 — Rafa has won the Rogers Cup Masters in Montreal, Canada by defeating Andre Agassi, 6-3 4-6 6-2. This is his 9th win in 10 finals this year and his 3rd Tennis Masters Series win (Monte Carlo, Roma). It's the first hardcourt tournament win of his career; the other 8 were on clay. Enhorabuena, Rafa! In his first match against Agassi, Rafa started strong and quickly began contesting Agassi's serve, eventually securing a break to win the first set. After an hour long rain delay, the players returned for the second set and Agassi came out with renewed energy and intensity. The second set was full of long rallies and Rafa's energy level seemed to be down from the first; he lost the second set by losing serve while down 4-5. In the third set, momentum swung towards Rafa and he grabbed it, hustling and scrambling to secure 2 breaks and the championship. Rafa's next tournament is the Western & Southern Financial Group Masters in Cincinnati, Ohio. The Singles Draw has been announced and Rafa, the No. 2 seed, will play German Tomas Berdych in the first round. Rafa won their only meeting, which was in Bastad on clay this year. Vamos, Rafael! 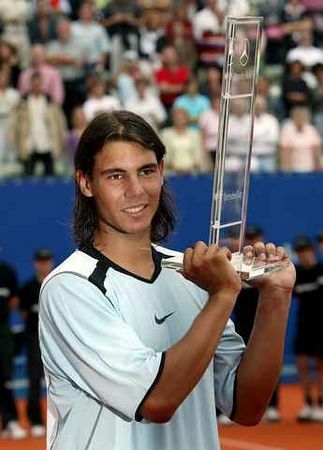 7/24/05 — Rafa won his eighth title of the year, defeating Argentine Gaston Gaudio, 6-3, 6-3, 6-4, at the Mercedes Cup in Stuttgart. It was Rafa's 34th successive clay victory, taking him to a career-high number two in the world behind Roger Federer. He also has offiically qualified for the year-end Masters Cup in Shanghai. Rafa got off to a shaky start, losing the first game, but he was able to break back on his seventh breakpoint opportunity. He did the same in the third set. He lost serve in the opening game, but broke back immediately on his third breakpoint chance. He broke again when Gaudio was serving at 5-4 to stay in the match. Rafa said it was a tough match, but he's thrilled to have qualified for Shanghai. "It's a dream," Rafa said. "Now I'm among the eight best players in the world. It will be my first appearance and I want to do well." In addition to the trophy and prize money (and the VamosRafael.com bear! ), Rafa won a new Mercedes Benz automobile. Although he doesn't have a driver's license, the tournament organizers allowed him to drive it on center court. Perhaps this will motivate him to take driving lessons. After the match, Gaudio said, "He took my Mercedes, so I have to come back next year to win it." The reporter helpfully suggested it may be easier to buy one.